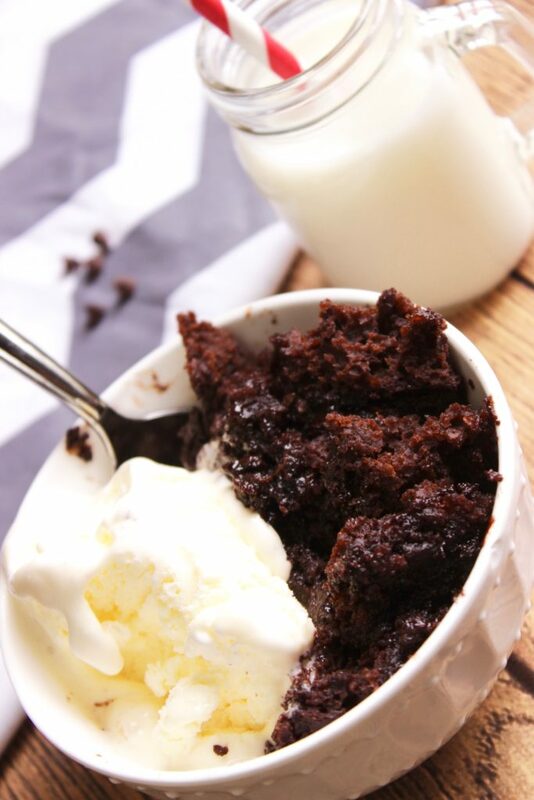 This Crockpot Lava Cake dessert recipe is the easiest dessert I have ever made. Hands down! Need a quick dessert recipe in a flash? This is it! Crockpot meals are lifesavers. 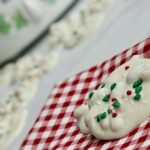 Crockpot desserts?? Pretty much the coolest idea ever! And, this recipe… is amazing! The best part about this lava cake is that it can be served hot without taking up space in the oven since it’s in the crockpot – an even bigger WIN in my book! 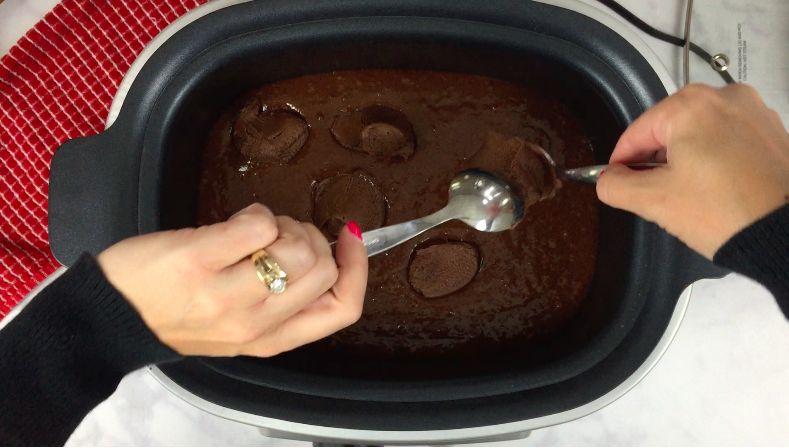 And, this crockpot lava cake is only three ingredients – win-win-win, right?! Next, gather your tools, a crockpot, a mixing bowl, spatula, measuring cups (both dry and wet). And, you’re ready to rock and roll! 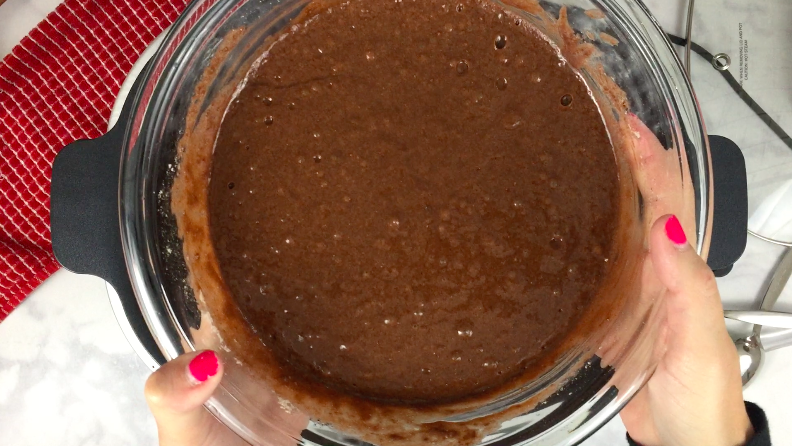 Pour the prepared cake mix into the crockpot. They usually call for eggs, water and oil, so be sure to have these things on hand. 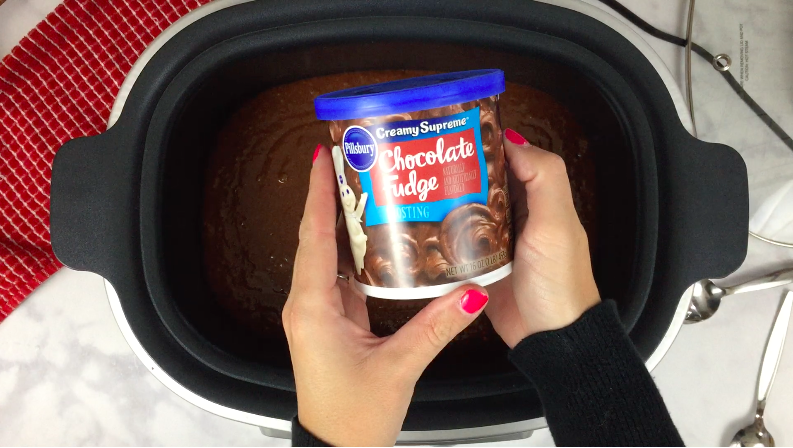 Drop the fudge frosting onto the cake mix by the spoonful, but don’t stir. 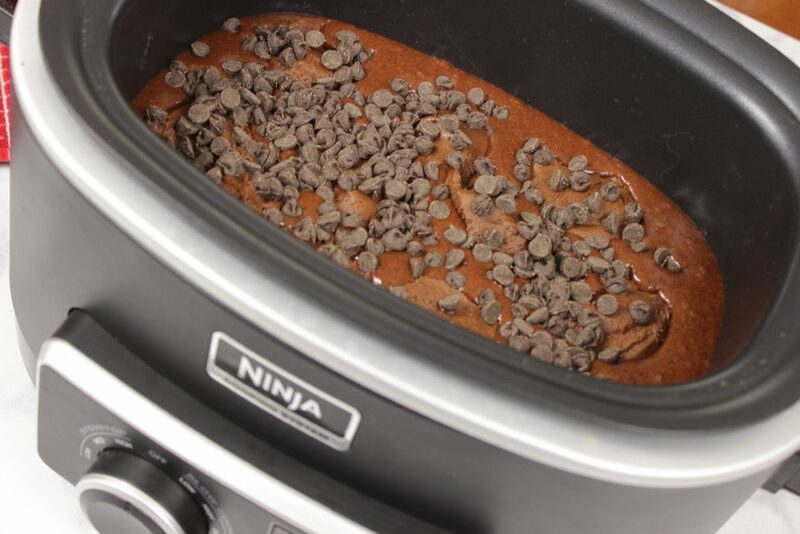 When I say the crock pot does all the work in this easy crock pot dessert recipe — I mean the crock pot does all the work! Sprinkle the chocolate chips on top and put the lid on. Yes, that’s really it. Let the crock pot do it’s work on high for 2.5 hours. 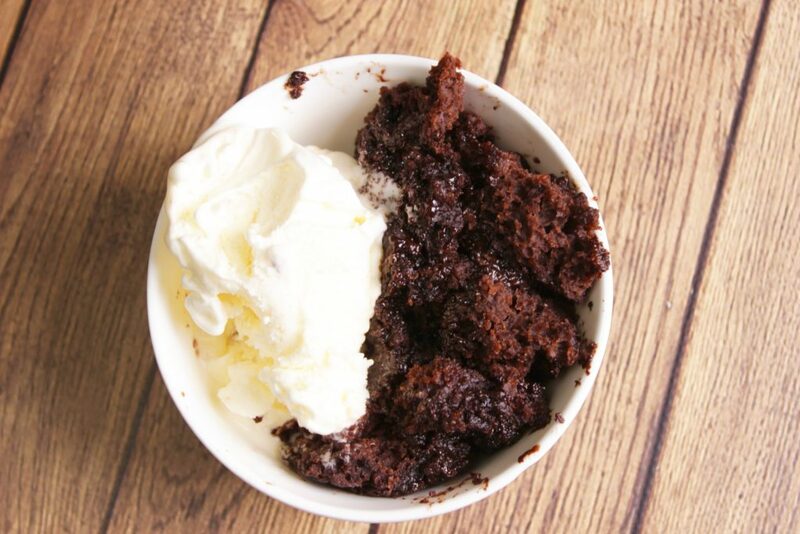 Once the crock pot is done serve this delicious crockpot molten lave cake recipe with a scoop of vanilla ice cream – amazing, I tell you! 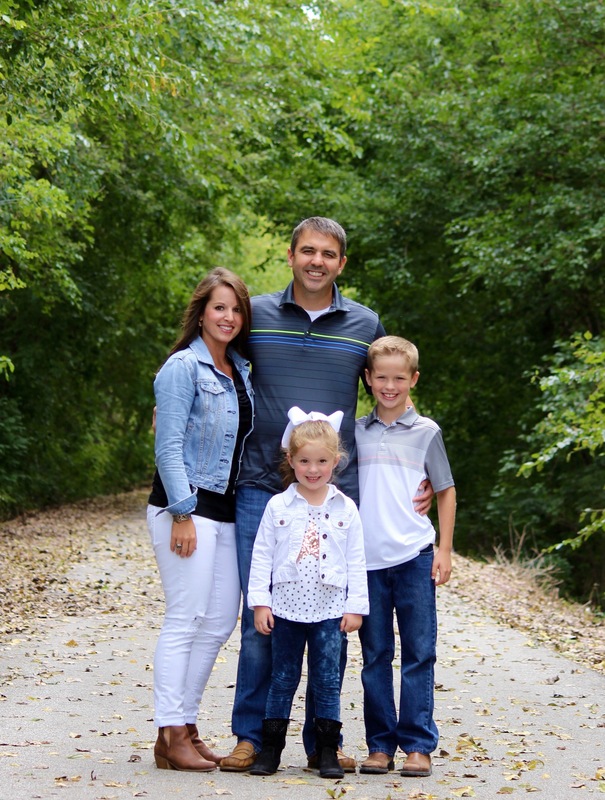 What’s so wrong with cake mix, your kids to good for it? I never use mixes, either. Most things taste better from ‘scratch’. I was just raised that way. My recepie only takes 45 minutes to cook in an oven. 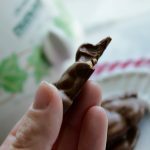 I have a microwave recipe from Pampered Chef and it takes15 minutes to make. Will you please share the recipe? ‘too’. If you’re going to insult someone, do it in proper English. Who died and made you the spelling police? So next question is why make a comment to start something if you’re not willingly to finish it? Seriously? This comment was certainly not necessary. She just asked a question. Clarissa Moore some Cake mixes have chemicals in them that aren’t necessarily good for you and some of us avoid them when possible. Cynthia in answer to your question, sense no one seemed to want to answer it, yes you can do it from scratch. You might want to make the icing just a little thicker than you normally do sense it is going to be heated. I’m a scratch baker too and I know where you are coming from. instead of frosting….use chocolate pudding…..that is how I always make it…. That’s just rude. A lot of people cook from scratch and it’s not because they are too good for box mixes. Scratch actually taste better. Actually any time you can make something without all the extra added ingredients you are putting a better product in your body. Good job grannie! ….what a smarta** answer, scratch is always tastier AND perhaps she doesn’t want her kids eating all the chemicals and coloring from a boxmix….you need to change your attitude or stay off here….you wanna fight someone with your words, go elsewhere, this isn’t the forum! Cynthia, I would suspect that any similar sized cake recipe would work just as well. Probably the icing, too. But its difficult to say for sure. I might try this sometime, I’ll let you know if it works from scratch as well. Sense you pre-make the cake mix their is no reason a home made cake from scratch shouldn’t work. Any flavor icing will do. I used a salted caramel as this is too much chocolate for us. How did this turn out? I’m thinking about using vanilla. Make you from scratch cake and put it into the crock with your own butter cream frosting and chocolate chips. Would you cook this on high, med or low??? i’d love to try this recipe . what setting would you cook it At ? thanks for this wonderful recipe !! hi i have not seen the frosting in South Africa. Is it a normal thick icing that you use to decorate a cake? How do you think this would turn out if you used a different flavor icing? Say, vanilla or butter cream? Then it’s not a traditional lava cake. Do whatever you want! Or how about using peanut butter chips! Doesn’t have the same effect as the chocolate icing. Tried it last night and wasn’t as good. Yes. Set your oven at 300 F and it should work. At about 2 hrs you might want to start checking it ovens cook differently. Good grief, people! She was providing an easy recipe for people to try. You want to do “scratch,” do it but don’t be judgmental. And don’t be stupid! Of course, scratch would work and of course an oven would work!!!!! Again, she was just providing an easy thing for people to try…..or not. LOL; true. Good Luck to all; the recipe sounds yummy. I have recently started trying recipes in my crock pot and am excited to try this one! 😉 Blessings! some people will make a federal case out of anything! Either try it or don’t, no need to make a big issue out of it. You are so right. I don’t know why some people think they need to criticize when someone asks a simple question. I appreciated the recipe and am anxious to try it, maybe next family dinner. Yes, I agree ! It a cake recipe! Some folks like it one way , others a different way! Who knows a change might come up with a totally different yummy dessert! JCNana, I’m with you! My granddaughter want chocolate cake and vanilla ice cream for her BD and since we are living in our RV for the moment I don’t want to heat it up with the oven so I am using the crockpot. This is the one she will get and I’ll bet she will love it. Peeps, take it for what it’s worth. Quick and easy! Especially for Bakersfield, CA when the temp here today is 103 and expected to reach 108 later this week! Is it 2 hours on high? I wondered if it’s actually 2 hrs as in the directions at the end it shows to cook it for 1 hr….. I think this looks Great, I’m so glad you added the video.Thank you so much for posting it. I have a crockpot with actual temperatures. What do you suggest? 400° is the highest which seems pretty high for 2.5 hours cooking time. Thanks! 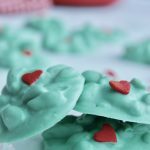 Could I add maraschino Cherries to the recipe? I was thinking of draining a jar full and just pouring them in. Would it be okay to make this earlier in the day and then put it on a low setting for an hour or so before serving? I am definitely going to try this – thanks for sharing. AND if you have time to bake anything from scratch along with raising kids, working, laundry, dishes, yard work, shopping, cooking, etc. etc. – then you are seriously blessed. Planning to make for our church ladies tonight.My son makes and its great ! Yay Karen! I am so glad to hear that! What size crockpot, does it matter? This looks like it would be a delicious chocolate cake recipe for even my best friend that is absolutely the pickiest of the pickiest of eaters.. even when it comes to deserts! Hi this does look very good and really easy. 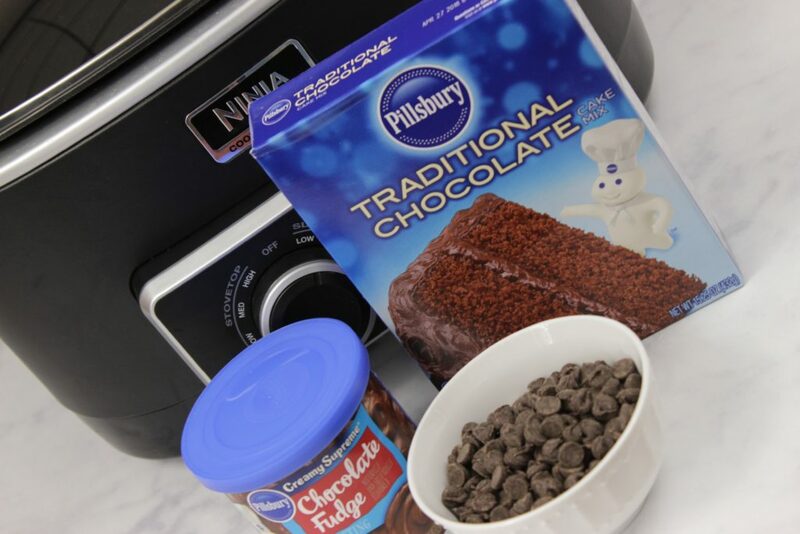 I can’t wait to make however I was wondering if you can use a different chocolate cake mix instead of the traditional? I accidentally bought the same Pillsbury chocolate cake mix, but instead of traditional its moist supreme. Will that work? Yes you can use any mix, and Icing. I made a strawberry cake and used lemon icing last week. Strawberry lemon cake was awesome. Do you preheat the crock-pot or dump all in and then turn it on? Never was sure about that part. Kay, I just made a similar recipe the other day. I put the ingredients in my crockpot, then turned it on. It took about 2.5 hours to cook from the time I turned it on. Hi what size crockpot and would a casserole crock work? I bought chocolate frosting instead of fudge frosting and was wondering if anyone else used chocolate instead of the fudge and if so how was it? Can’t say on taste of the chocolate over the fudge, but it will work. I mix and match , you can use any mix, and Icing. I made a strawberry cake and used lemon icing last week. Strawberry lemon cake was awesome. How did it turn out with the chocolate icing. I live in Canada and we cant get fudge icing here. Only chocolate or milk chocolate. I used chocolate icing and it was fine! Looks like two other people asked this already without it being answered: What size (quart capacity) is the crack pot? This will matter for cooking times and product consistency. Thank you in advance! Just mentioning that those worries about ingredients in store bought mix and other things… you can buy all organic cake mix and frosting. It’s not from scratch… but it will lack the stack of crap in the regular brands most people use. 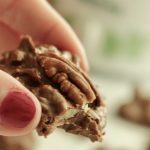 This is a quick fix to a dessert! 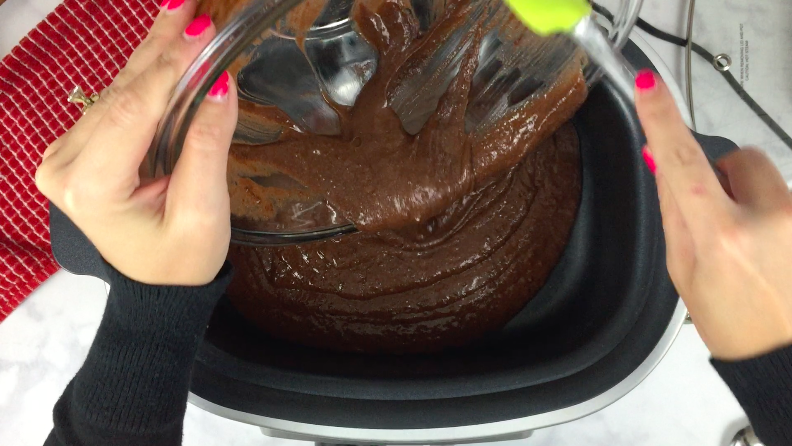 Tried this lava cake in my crockpot and after 2.5 hrs it was mushy and needed to cook longer. Maybe 3-4 hrs. Guess it depends on the kind of crockpot you have. Do you bake the cake first? Second question is if you dont bake cake do you mix indredients up first? Could you double this and use the same time? Curious to know why it says 2&1/2 hrs then says 1 he cook time?? Do you set the temp at high or low? Thank you for the delicious recipe that you posted for the Lava Cake. I will be making it on New Years Day for Adults and Children alike. It is such a treat for all! It has become one of my favorite winter recipes! So simple!! Thanks again! Do you set it on high, medium or low? Use prepared cake mix raw. Use 4 to 6 quart crock pot. 1. Can you cook it on low for a longer time(as in while I’m at work so it’s ready when I get home)? 2. It is still good to reheat if it’s not all eaten in the first sitting? Hi Sarah, I am not sure because I haven’t tried cooking it longer on a lower time, so sorry about that. Yes, it is good to reheat – we ate it as a leftover and it was great! Thanks for sharing. I love quick and easy recipes. Quick question – Should I use some nonstick spray? I’m thinking of making this for a Superbowl party. Is it too messy to remove from the crock to carry to the party? Should I leave it in the crock and serve from there? I loved these questions & comments. I was wondering if you stick a possum in your crockpot & cover it with choc chips would it be just as good?? Okay my 8 year old and I did this tonight foe my wife’s birthday. Tastes amazing, didn’t turn out right. 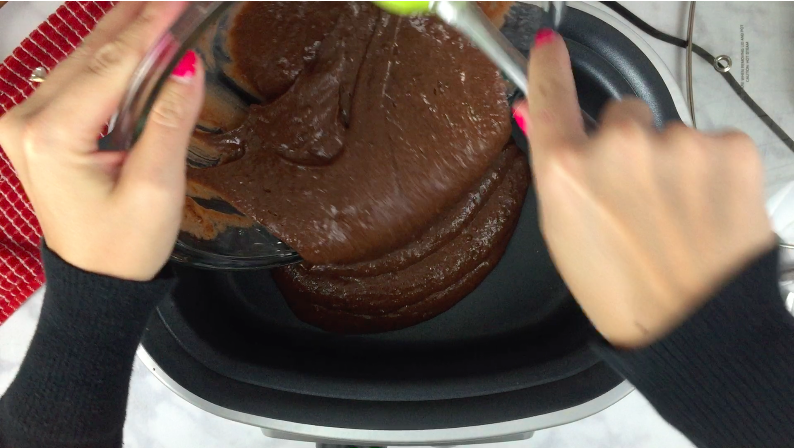 For some reason our chocolate fudge frosting (same stuff as video) sank to bottom of mix and spread out. So when I pulled cake out the “lava” was literally molten lava at the bottom and not spread throughout the cake. I thought maybe I should cook the batter about a half hour next time and then add the frosting. Made this for my granddaughter and she LOVED IT!!!! She wanted a “lava cake” and I was pinched for time. So your recipe was a true blessing! Thank you for sharing. My niece makes something similar, only she uses cake mix (mixed as directions call for on the box) with uncooked pudding in the middle. Cooks 4 hours in the crock pot. By the way, some people have to stick with a gluten free diet, due to celiac disease or allergies, which is why they might not want to use a boxed cake mix. Made it this morning, use chocolate cake, hot pink vanilla frosting, espresso powder and chocolate chips. Hi Lisa! So excited that you’re making this, it’s one of our favorites! Why size cake mix did you use? ONE for an 8×8 Or 9×13? Just cooking the cake alone (Thinking about a Poke Cake) would the cook time be the same? Or do you think it should be less? Because the pudding and icing is added after the cake is cooked and cooled. I did not see a printable version as stated in the explanation on line. Could you please send me a printable version? Hi Sheri, Sorry for the late response. I am not sure as I’ve never tried this. Just wow on all comments. If you don’t like move on. Im legally blind so please make fun of my typing if youyou want I don’t give a rats @@@. Thank you for sharing this I could read the typing with my magnifying glass just fine. I made this for my husband and grandchildren. It was awesome with a scoop of vanilla ice cream! They loved it. Will definitely be making this again. I’m going to try it using Nutella instead of frosting. This recipe of the Lava cake, is just a simple way to make a cake and if you want to try it, try it. Don’t have to try to show anyone if it’s healthy, or change the sharing of a recipe. I’m going to try it, thank you. What temp does the crock pot go on? Whatever the box says? I’m just curious. Why all the questions about, time, heat setting, mixing cake, spraying with non stick spray, size of crock pot, ECT? Everyone of those questions are answered in the recipe. Just read the recipe. Is the cake mix for a 9×13 pan or 8×8. Does that effect the amount of time if it’s an 8×8 mix?